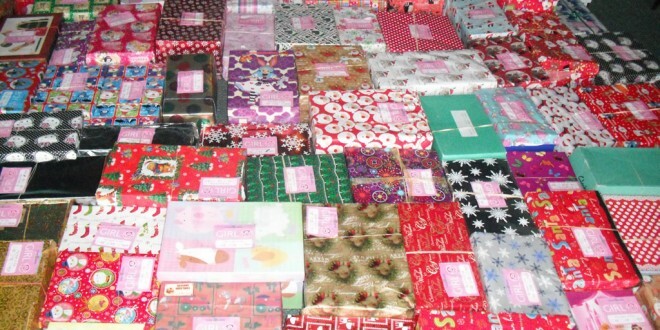 Over 4,500 Team Hope Christmas shoeboxes, filled with gifts for needy children in Ukraine, will be leaving Ennis this evening (Tuesday). Over the past three weeks schools, businesses, factories and individuals throughout the county have put together the shoeboxes which were packaged at Elevation Business Park, Clonroad, Ennis. “We have packed all these boxes into cartons to be loaded onto a lorry this evening. There will be 489 cartons to put onto the lorry, which are filled with 4,561 shoeboxes to get to needy children in Ukraine before Christmas,” said Margaret Angland, Clare coordinator for Team Hope.